Hi, I was wondering if you could please tell me the difference between a mastercard and visa. I currently have a virgin mastercard but am going to the States soon and have been told I am better off with a visa card. Is this correct? Very much appreciated thanks. My Answer: For starters Visa and Mastercard don’t actually issue cards themselves. They operate the computer systems that process transactions on their network by people buying products/service or withdrawing money from ATM’s. Both make money by charging fees to banks that issue Mastercard/Visa branded cards. All the actual features of the credit/debit card (interest rates, reward programs, interest free days etc) are set by the bank, credit union or building society that issued your card. Both kinds of cards are widely accepted worldwide in retail outlets and cash machines. However in certain areas acceptance levels may vary. My experience is that sometimes when travelling ATM’s won’t let you use your Mastercard/Visa card so it’s always handy to have another card from the other network which you can use instead. Specifically this happened to me a few times in Western Europe and also in Asia. Also keep enough cash to pay for at one or two days expenses in case none of your cards work. Reports from elsewhere on the net suggest that card acceptance is much more likely to be a problem in “non-Western” places like: Asia, Africa and South America eg: The Cuban banking system which does not recognise any financial instrument issued by a US bank. 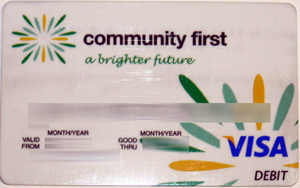 In my experience the best Visa debit cards are usually offered by Credit Unions / building societies / small banks. These cards come with no annual fee and some even offer transaction fee rebates if you have savings/term deposit accounts with them as well. its really a good comparison because everyone must know about the difference between mastercard and visa. The difference between a Visa and a MasterCard is that Visa was the first card sponsored by Bank of America and banks that were affiliated with them. In response, the other banks sponsored MasterCard to do the same for them. Each group signed up merchants (with a small percentage charge from the merchant to process the transaction, of which the banks also got a portion) to accept their card, sometimes, exclusively. But in time, the differences between the two narrowed so that now, most places take both credit cards. I have always had a Visa but have never had a MasterCard. It might be a good idea for me to get a MasterCard if I am ever going to travel to other countries. In the US, I have never made a purchase somewhere where Visa was not accepted. Some places do not allow me to use my Discover card or American Express though. PS What’s a “Discover card”? I’ve never heard of it in Australia. In several countries in Europe, VISA is not accepted at any of the supermarkets or virtually any shops with food (Austria comes to mind). Mastercard is the card of choice there. I recommend carrying both. Next time I go, I will have mastercard, visa, and amex. Discover is a credit card. Most places here in the U.S. accept it just as they do Visa, MasterCard, and American Express. Although there are some places that do not accept it and only take Visa or MC. Maybe they do not have it or accept in in Australia? As far as most consumers are concerned, there is no real difference between the two. They are both very widely accepted in over one hundred and fifty countries and it is very rare to find a location that will accept one but not the other. With my master Card obtained form one of the banks in Nigeria, can i use it in any country or is it restircted from some countries? my experience is that any place that accepts mastercard will accept visa. I never came a cross a place that doesn’t yet. The only difference that you might get is the interest rates and the fees, and credit limit. Discover card was founded out of Sears and is now its own entity. They have indicated their push to expand outside of the US through their organic growth into South America, partnership with CUP (China) & JCB (Japan) and most recently the acqusition of Diner’s International network. Discover will eventually be accepted at all locations that Diner’s currently is.